2018 was not a record year overall in terms of material re-used, however Bulkers, Containers and Small Dry vessels all recorded their lowest ever scrapping levels since 2012 by number of vessels. 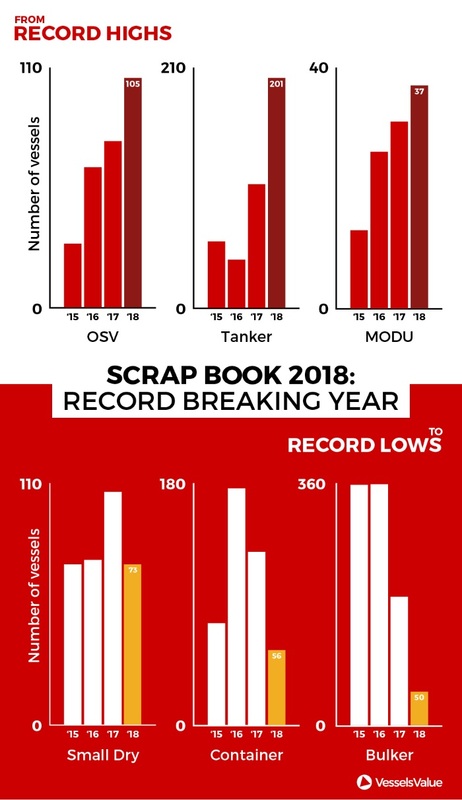 Meanwhile, OSVs, MODUs, and tankers all recorded the highest levels of scrapping over the same time period. There were only 656 vessels removed from the water compared to 755 in 2017 and 811 in 2016. There are three main factors that will cause an owner to remove a ship from service: a higher price being offered by recycling buyers; current, as well as expected, spot market returns; and the cost of drydocking a ship at its next yard period. The dollar per lightweight ton (LWT) cost of recycling ships is driven by demand in the physical economy and correlates with the price of raw steel. Prices per LWT rose throughout 2017, but most recycling occurred when prices were essentially flat in 2018. 2018 was a banner year for recycling activity in older tanker tonnage. The number of removals from the VLCC fleet were in line with our highest estimates of tonnage removal. The number of ships being removed from service has drawn down to a trickle in 2018 as recycling yards have other options for their slots from the tanker and bulker markets. The slowing of deletions is not a cause for panic among asset holders though, as fundamental support for firmer prices remains. Hopefully, 2019 will see a continuation of this trend in vessel scrapping. Tidewater’s steely focus on scrapping nonperforming vessels should encourage more owners to follow suit. The benefits of reducing oversupply will be felt throughout the industry and help bring balance sheets back into the black. However, it is a bitter pill to swallow. Many of these vessels will be sold at levels far below the purchase price achieved prior to 2014 and owners will have to make the painful decision of taking a haircut on these vessels. The top shipowner selling vessels for recycling is American Offshore owner Tidewater, who sent 21 vessels to be scrapped. In second place is the South Korean owner Sinokor selling 11, followed just behind in third place by Nordic American Tankers, with 10 being sent for recycling.